There are these brands that you see all over social media and somehow there is never that chance for you to get your hands on them. That’s exactly how my relationship with 107 Oneoseven was until now. 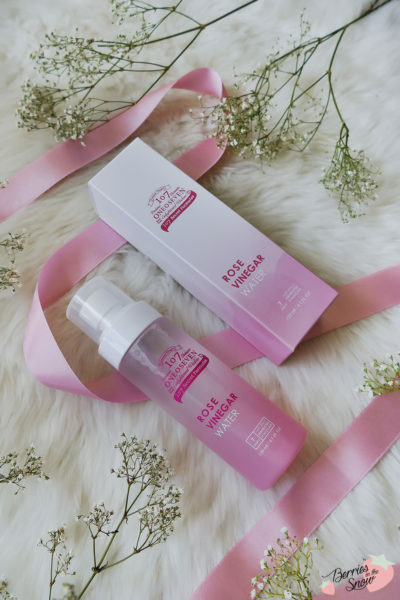 I have read and stumbled over so many reviews about this korean cosmetics brand, and I can’t believe that this is really my first own review for it. 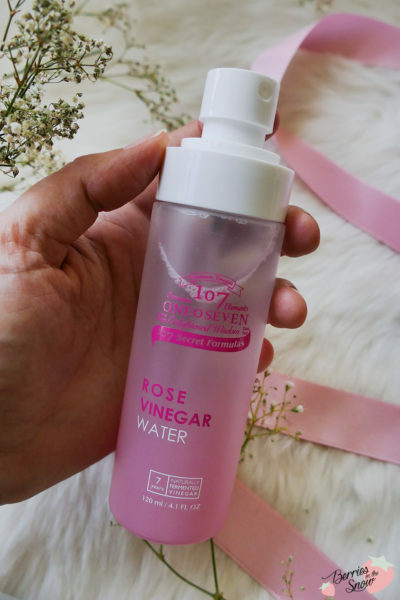 Here is my impression on the 107 Oneoseven Rose Vinegar Water, which was provided to me by Beautytap.com. The brand 107 Oneoseven uses as key ingredient traditionally brewed Hanega vinegar, that has aged for 5-7 years. The vinegar is brewed with 20 oriental herbs to produce the optimal and best amount of essential amino acids. The brands name derives from the 107 secret formulas that have been kept for 35 generations for improving the skin and body. 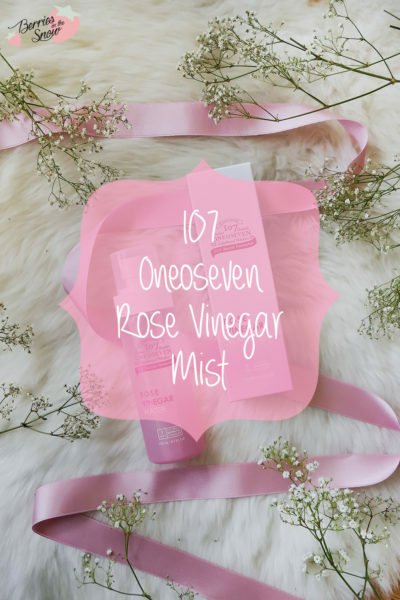 The 107 Oneoseven Rose Vinegar Water is a rose water based mist that contains the famous vinegar. It is the perfect combination to provide moisture to your face whenever needed. It can be used after cleansing as toner, for setting makeup or before using masks. 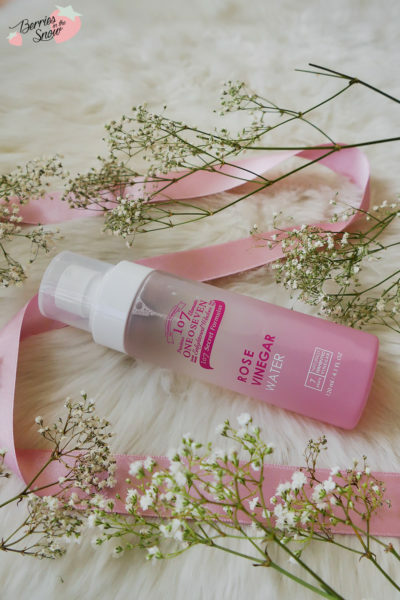 It comes in a cute pink colored spraying bottle, that sprays a very fine mist. The ingredients are short, though not as short as for the SanDaWha Camellia Flower Hydrating Mist. But still the ingredients are nothing to sneeze at! 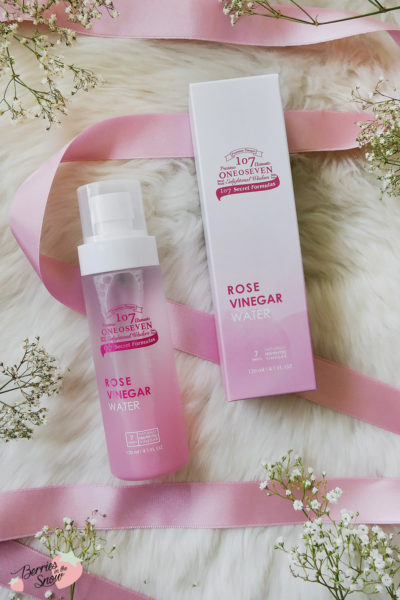 The list consists of course Rose Water, which I love for its luxury scent, but it also acts skin conditioning, anti-bacterial, contains many antioxidants, etc. Additionally, hyaluronic acid and a mix of amino acids are added. Last, but not least the mist contains 1 ppm (parts per million) Vinegar. You can check the ingredients via SkinCarisma if you want to know more details. I have discovered that this mist has also a very calming effect on my skin. Whenever I use the fine mist and my skin feels somehow reddish and irritated my skin seems to calm down after I apply the mist. I really love that effect, but I don’t know if this is only a coincidence either. Only my observations while using it. The mist is also suitable as setting mist after applying make-up, and give the skin a natural finish and makes your skin look more hydrated. 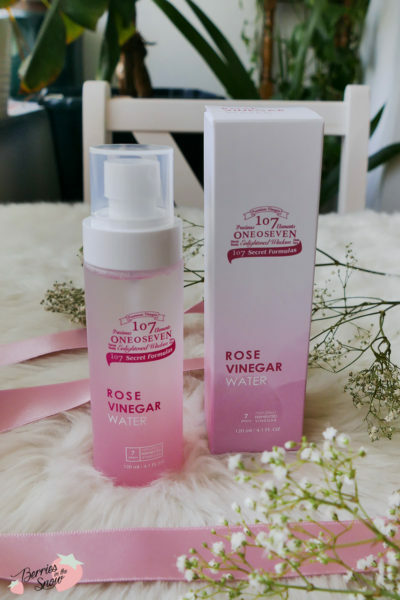 The 107 Oneoseven Rose Vinegar Water contains 120 ml and is on sale right now at by Beautytap.com for 19.60 US$ instead of the original retail price of 28 US$. 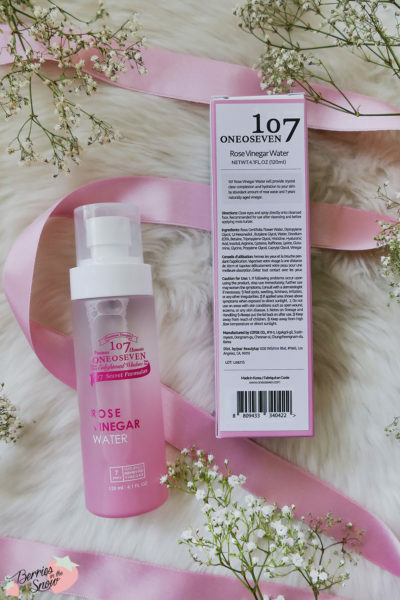 That to be said, the products from 107 Oneoseven are a bit more expensive compared to other more available Kbeauty brands. Yet, the selection of natural and high-end ingredients combined with the traditional oriental vinegar may justify the price. By the way, since we are talking about vinegar here: I know that in Korea many people drink vinegar (drinking vinegar), and it is supposed to have many health benefits. Have you tried these drinks already? I would love to check that out, but last time I went to the asian super market I forgot to have a look for it. Just as a short reminder: All products mentioned and reviewed on this blog are of my personal opinions. This product here was sent to me for reviewing purpose by https://beautytap.com/ which doesn’t influence me in providing my honest opinion on the products. This mist and it’s ingredients sound lovely! The 107 Oneoseven story is really cool. I’m a big fan of their Coreflex Cream.